Lemon Blueberry Sweet Rolls are soft sweet rolls that are bursting with fresh blueberries and covered in lemon cream cheese frosting. They are the perfect treat for breakfast or brunch. My dad’s Cinnamon Rolls are hands down the BEST cinnamon rolls on the planet. I hope you have all made them. If you haven’t, add them to your to do list NOW! They are our family’s favorite and everyone that tries them falls in love. They are absolute perfection. My dad came to visit a few weeks ago and we made a spin off of his famous cinnamon rolls, Lemon Blueberry Sweet Rolls. My dad is always up for baking with me. 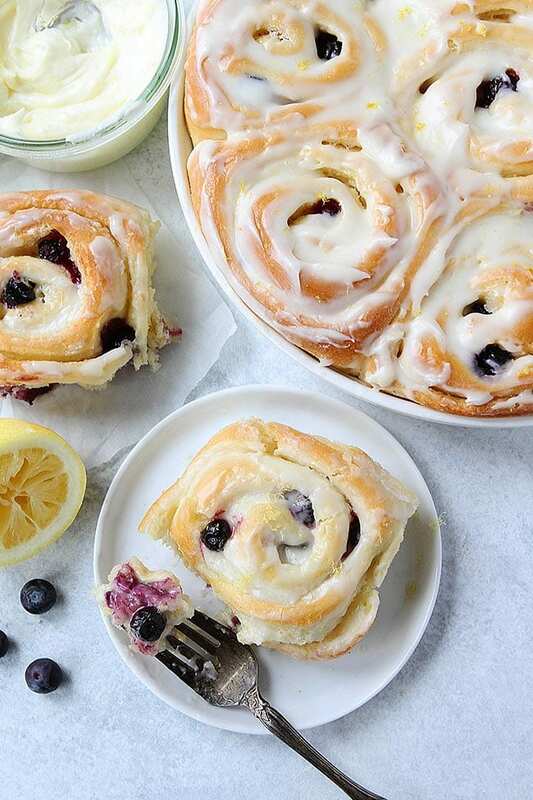 We’ve made Raspberry Sweet Rolls before and they are amazing so we decided it would be a good idea to invite lemon and blueberries to the party. 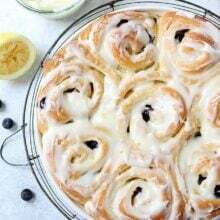 Lemon and blueberry always make a good team and I knew they would be amazing in my dad’s famous roll dough. 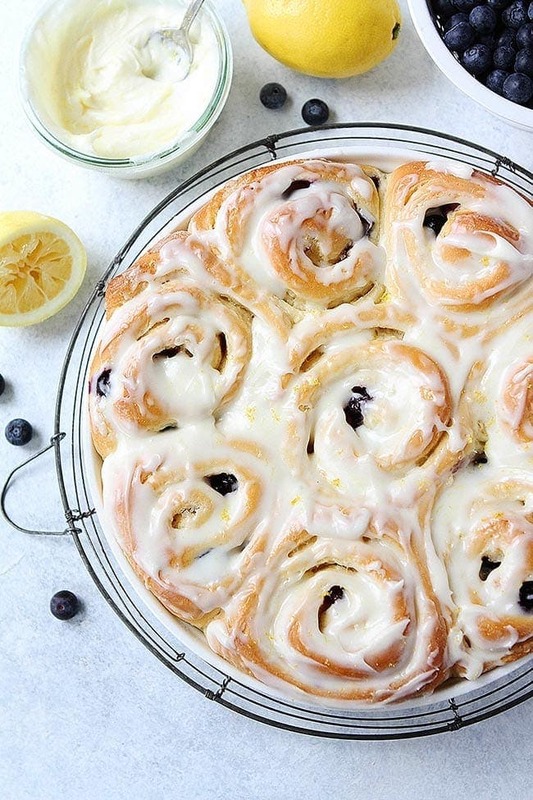 I was right, these Lemon Blueberry Sweet Rolls are so divine! We were all swooning over them! They are definitely a new favorite. My dad’s sweet roll dough is perfect in every way. It comes out perfect every time and the dough is satiny, smooth, sweet, soft, tender, buttery, and melt in your mouth good! 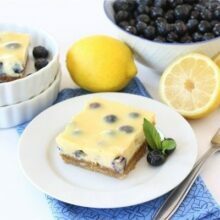 The dough was perfect for the lemon and blueberry combo! My dad uses active dry yeast for the dough. My dad also uses shortening (Crisco). I normally don’t use shortening in any of our recipes, but I stick to my dad’s recipe and use it here because the rolls are so perfect. If you don’t want to use shortening, you can use butter. You will need about 9 cups of all-purpose flour for this recipe. You might need to add a little more if the dough is too sticky. Let the dough rise in a warm place and allow the dough enough time to rise. You don’t want to rush the dough. The dough needs to rise twice, once before you roll it out and once after you form the rolls. Use dental floss or thread to cut the dough into rolls for best results. 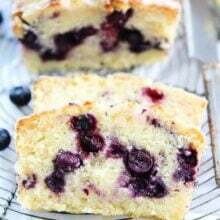 Fresh blueberries are best for this recipe. Let the sweet rolls cool for about 10 minutes before you frost them. You want the rolls to be warm, but not hot. You can make the sweet rolls in advance. After the rolls are in the pan, cover them with plastic wrap and place them in the fridge overnight. Remove from the refrigerator in the morning and let rise. 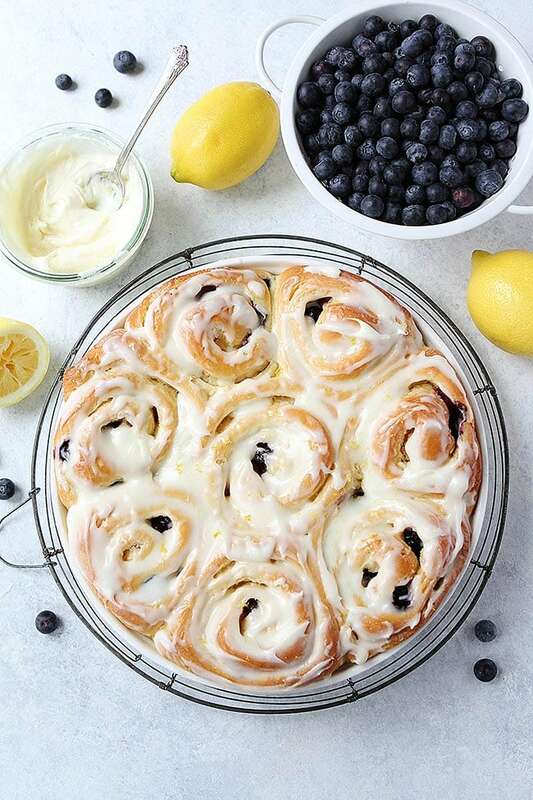 The Lemon Blueberry Sweet Rolls are the perfect treat for breakfast or brunch. They do take some time to make, but they aren’t hard. We like to make them on weekends or for special occasions. Make them for Easter, Mother’s Day, 4th of July, baby showers, bridal showers, birthdays, Christmas, or just because! Enjoy a Lemon Blueberry Sweet Roll with a cup of coffee, tea, or milk. They are SO good served warm. You will want to lick the plate to get every single bit of that lemon cream cheese frosting. And when you get a bite with a juicy blueberry, you will be in heaven! Enjoy! 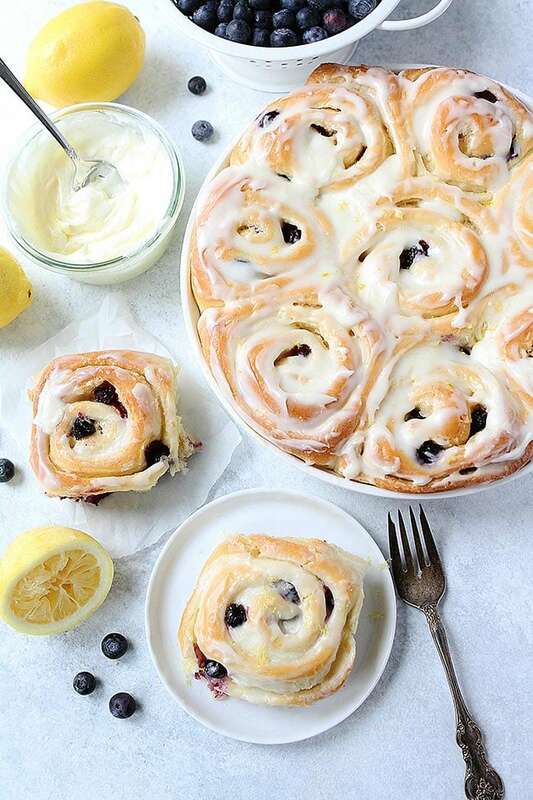 Lemon Blueberry Sweet Rolls are soft sweet rolls that are bursting with fresh blueberries and covered in lemon cream cheese frosting. They are the perfect treat for special occasions or weekend breakfasts or brunch! Remove dough from bowl and place on a lightly floured counter. Divide dough in half. With a rolling pin, roll one half of the dough into a rectangular shape. Spread dough evenly with 4 tablespoons of softened butter. In a small bowl, combine the sugar, lemon zest, and lemon juice. Rub together with your fingers until fragrant. Sprinkle half of the lemon sugar mixture over the butter. Reserve the other half for the next round of dough. Place 1 cup of the blueberries evenly on the sugary dough. Gently roll up dough into one long roll. Cut rolls, using a piece of dental floss or thread, about two inches thick. Place rolls into a greased 9X13 baking pan, leaving a little space in between each roll so they have room to rise. Place rolls in a warm spot and cover with a towel. Let rolls rise until double in bulk, about an hour. Bake rolls at 350 degrees F for 25-32 minutes or until golden brown on top. The insides should be soft, but not doughy. Remove pans from oven and let cool until slightly warm on a wire rack. While the rolls are cooling, make the frosting. In a medium bowl, combine butter, cream cheese, confectioners' sugar, lemon zest, and lemon juice. Using electric mixer, beat until smooth. Spread frosting on rolls and serve. These will be the star of every brunch table this season! Store in an airtight container on the counter or cover with plastic wrap. Mmmm… I have to make these sometime! They look SOOO good. I love this dough! It has a lot of ingredients and steps but is well worth the time and effort! I didn’t use Crisco, I used coconut manna instead. And I added some cream cheese inside to. They came out divine!! My whole family loved them. I’m also going to try it with raspberries that grow on the property. I think peaches might be good to! Making them again today! Just wondering if you have ever halved the recipe successfully? We are a small family of three and I don’t want these lingering around too long or I will eat them all!! Oh my gosh! 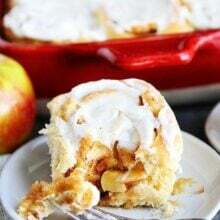 My daughter sent this recipe to me from your Instagram page with the drooling face emoji 🙂 I had everything I needed to make them so I figured why not? This is the first time I’ve ever attempted making sweet rolls and I have to say, no one was disappointed. My family was literally standing at the oven waiting for them to come out! I followed the recipe precisely with the only exception being when I got to the sugar, lemon zest, lemon juice mixture, I added a cup of the vanilla sugar I have had in my mason jar for about 9 months and a half a cup of regular sugar. I had read that if you added your used vanilla bean pods to regular sugar that after a few weeks you would have vanilla sugar, seriously yummy! Needless to say these were a huge hit with my family and my co-workers. 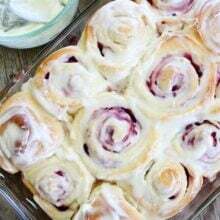 I will be making the raspberry sweet rolls next! You have a fan for life now!